So! Daniel started preschool! Did I mention this? At age 3, kids “graduate” early intervention and if they are still in need of services, they start getting them through the school district. Which means, PRESCHOOL! 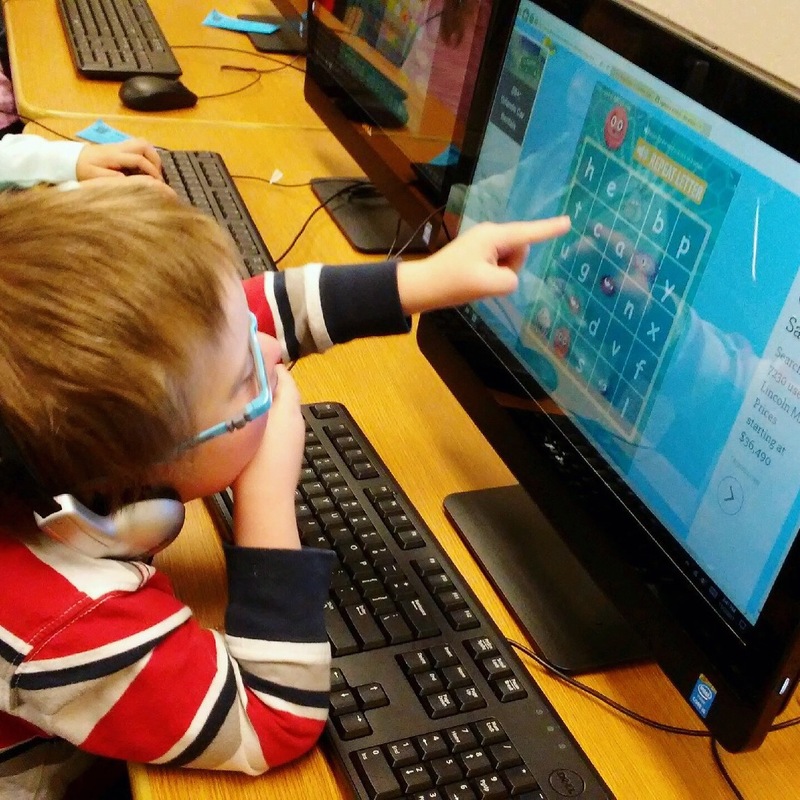 Daniel actually started a couple weeks before his birthday, to give the teachers time to observe him so we could set reasonable goals for his IEP. Unrelated to the IEP meeting, Daniel LOOOOOVES school. Loves it. So much that I can’t get him dressed on non-school days, because getting dressed means GO TO SCHOOL! Or, at the very least, go somewhere in the car. He goes Monday through Thursday from 8 ish to noon ish. I think school hours are actually more like 8:45 to 11:15, but his bus picks him up about 8:15 and drops him off about 11:45. The bus! He rides the bus! He LOOOOVES the bus. His bus is just for the preschool kids, so it has carseats and comes right to our house. It’s pretty great. Anyway! Back on topic. His IEP meeting happened just before his birthday, and although “First IEP Meeting” seems intimidating, it really was not much different from his IFSP meetings, which have been happening since he was 8 weeks old. (For those who don’t know, IEP stands for individualized education plan and IFSP stands for individualized family services plan.) Anyway, I met with his preschool teacher, our coordinator, and the therapists he’ll see at school. (Physical, occupational, and speech.) His main goals for PT are to work on jumping, running, and lifting his feet higher when he walks so he can step over things, and step up onto a stair, etc. 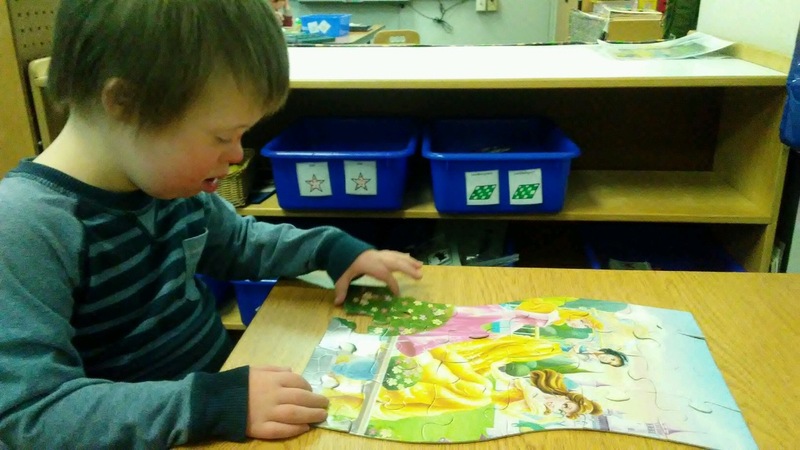 He’s doing pretty well with his OT stuff, the big thing we want to work on is eating with utensils, but that’s much more about behavior than fine motor skills. His speech teacher wants him to be able to name more objects (we talked specifically about using more signs.) The goal is (I think) 8 signs during a 15 minute period. She said he can definitely do that during snack time, but doesn’t do many signs during the rest of class. She asked if any of his previous speech therapists had talked to me about using more naming signs instead of just “more” or “please” when he wants something. I told her we haven’t actually had any speech therapists who did signing and that all the ones he knows are signs I’ve taught him. She was pretty pleased with that, and said she’d send a list of other signs that would be good for him to learn. And there you have it! I could be more detailed if I bothered to go find my notes from the meeting, but meh. It’s late. I was going to add a picture, but wordpress has other ideas. SORRY. I know we’re not even a week into school over here, but I have Thoughts. So that’s what you get today, aren’t you EXCITED?! Okay, deciding to bus Kalena has been the BEST EVER. I’m seriously so glad we did this. Not having to go anywhere is excellent. Plus it means only Kalena has to be ready to go anywhere by a certain time. I can see her bus stop from our front door, so usually Will and I just watch from the front porch until we see her get on the bus. I’d been walking down to the stop in the afternoons to make sure she got off at the right spot, but yesterday her bus was early and she got home about the time I was putting my shoes on. Whoops! I knew that I would miss Kalena’s help during the day with the babies. I had not realized how much I would miss having her here for Will to talk to. Because HOLY COW that kid never stops talking! All day long he talks at me! I’ve gotten into a bad habit of just responding “mmhmm” to everything. Or sometimes he ends with something like, “You say ‘yes’ mama” and then I do without even knowing what I’m saying yes to. It’s terrible and I know I should be listening better but OH MY GOSH JUST STOP TALKING FOR 2 SECONDS. The school sent home a list of “approved” snack foods and it is so weird to me. First of all, they don’t care what kids bring in their lunches, but they have specified foods (including brand!) that are okayed for daily snack. And I guess this is because snacks are eaten in the classroom? So they’re trying to avoid allergy problems? (I assume there’s an allergy-safe table in the cafeteria or something.) Also, they’ve differentiated between “daily snack” food and “special occasion” food which I TOTALLY get except that the way they’re split up does not seem logical to me. For instance, some foods included in the “daily snack” section: Marshmallow mateys cereal. Handi-snack pudding. Cocoa Roos cereal. Jello cups. Capri Sun juices. Hot chocolate. And some foods that are considered “special occasion” foods: Clif Bar fruit ropes. Pretzels. Animal crackers. What is going on here?! As much as the schedule sucked, I’m glad last year was only half days. Kalena is CLEARLY exhausted by the end of the day. Not that it’s changed her wake up time at all. There. Aren’t you glad you stuck around for all those deep thoughts? 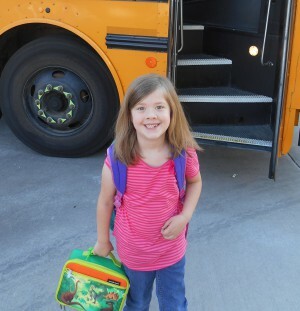 Well, Kalena started kindergarten on Monday. On the one hand I can’t believe it’s here already, on the other, she’s been excited to start since her last day of preschool in May. 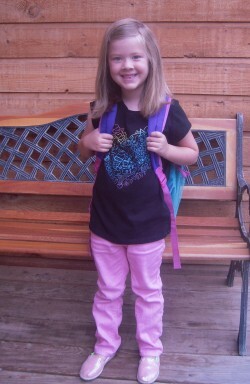 It’s a little surreal, because she’s going to kindergarten at the same school where *I* went to kindergarten. Sadly they’ve changed the bussing boundaries so now we live too close for her to ride the bus. (I always rode the bus.) Fortunately Brian’s schedule is such that he can drop her off in the mornings, so I only have to worry about picking her up. Anyway, here she is, ready to go for her first day! Back to kindergarten. Around here kindergarten is half day, which is fine by me. Kalena goes to the morning session, 8:45-11:50. That works out well for me since Daniel naps at 9. 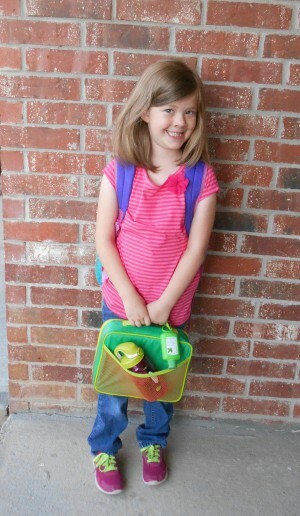 However, it’s finally setting in that she’ll be in school EVERY DAY. Which means I should probably get into some kind of routine with Will. And that routine should probably not be: let Will watch dinosaur documentaries all morning every day while Kalena is in school. (Though I’m sure HE wouldn’t object.) Anyway, Kalena is LOVING it so far. Hopefully that keeps up! 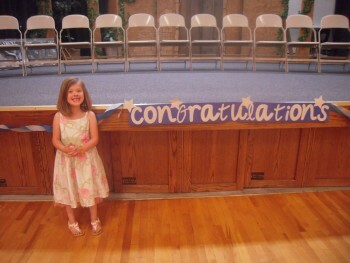 And here’s Kalena after “graduation” was over. It was pretty cute actually, they did a kind of end of the year program thing where the kids sang a couple songs for us. They also had cute little graduation caps, but all the pictures I took with Kalena wearing hers include people who may not want me posting their picture on the internet. So that’s all you get!